Make your baby boy the cutest kid on the block whether its nap time or food time, this delightful gift set that includes a personalised, sleepsuit, hat and bib guaranteed to make him melt everyone's hearts! Nap time has never been so cute with our beautiful personalised baby boy sleepsuit that can be worn every day, a real baby wardrobe essential, they are also unique baby keepsakes! Make sure your baby boy is looking his best every night with our adorable Playtime Print Personalised Sleepsuit, the ideal addition to every little one's nap time wardrobe. This super cute sleepsuit can be personalised with his name or monogrammed with his initials for a stylish Finish! 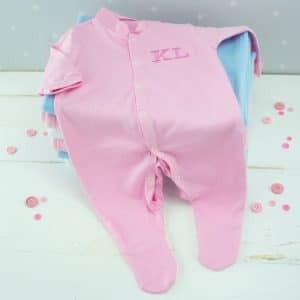 Nap time has never been so cute with our beautiful personalised pink sleepsuits that can be worn every day, a real baby wardrobe essential, they are also unique baby keepsakes with our complementary personalisation service! 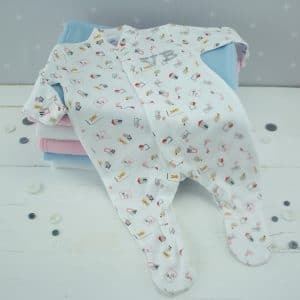 Nap time has never been so cute with our beautiful Personalised Unisex Sleepsuit, made from 100% cotton that is soft to touch against baby's delicate skin, making it the essential every day item for every little ones wardrobe. 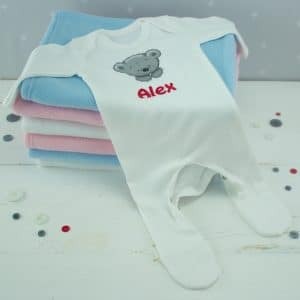 This sleepsuit can also be personalised with baby's name alongside our adorable teddy bear design for a truly memorable keepsake!